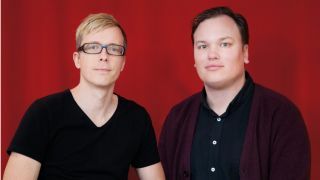 'Heads of industry: Kalle Paulsson (left) and Leo Nathorst-Böös (right). One of music software's most important, experienced players, Propellerhead has been making moves into the collaborative arena of late. Here are two of the company's product marketeers - Kalle Paulsson and Leo Nathorst-Böös - to tell us all about it. What do you both do at Propellerhead Software? What's your background in music, and your background in programming/product development? Kalle Paulsson: "We're both in Product Marketing at Propellerhead. Leo is responsible for apps, and I for the music sharing service that we launched in December of last year. As for our music backgrounds, Leo's part of an electronic pop duo calledBoeoes Kaelstigen, and I have been tinkering with electronic music as a hobby for the past 20 years." You recently launched a collaboration platform for users of your software and iOS apps - did you get the collaborative idea after releasing the apps, or was it always the plan? Leo Nathorst-Böös: "Collaboration has always been at the core of what we do. It started with ReBirth in 1996 - with tiny song files that people passed around via email - and continued with Reason's self-contained file format. It has also been a big part of the success of Figure. Making collaboration even more accessible to a wider audience with the Propellerhead service was a very natural step for us." Transferring to and from the platform is a very easy process. How hard was it to set the system up to work like this? LNB: "It may look easy on the surface, but there are a lot of things going on that are invisible to users. Designing something to be simple is much harder than making something complex!" Any plans to incorporate ReBirth for iPad into the Propellerhead collaboration ecosystem? Or any other products? LNB: "We're continuously rolling out updates to the service based on feedback from our users. I wouldn't rule out ReBirth being connected in the future, but we can't promise anything. Right now, we're continuing to evolve the platform, and we recently added things like connections between pieces, so you can see what a song is based on, and how it's been used in other work." What do you think of the future of iOS as a music-making system? Are you expecting it to gain even more momentum as time goes by? Your apps are relatively lightweight and cheap/free - some might consider that as being cautious about the format. KP: "Quite the opposite - we're very excited by iOS as a music-making platform. But we don't think that replicating the DAW on iOS necessarily is the right way to go. When we're using our phones for music-making, we're often in other situations than when at the computer, and we want to cater to that, and make the experience of using our apps right for the platform. Figure, for example, was designed specifically for those two/three-minute moments of found time we all have - like when we're waiting for the bus."